The Companion App is needed to collect the calendar data and upload secured to the qooApps server hosted by STRATO. Only the shortend entries from the calendar and your private Code, which only shown in your Garmin App, will be uploaded via secure HTTPS. On the server it will stored in an encrypted database. The data will not shared to anyone and will only used by the watchface with the correct Code. 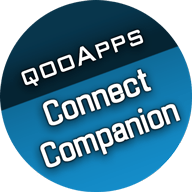 Click on the icon to install the qooApps Connect Companion. This is the watchface for your Garmin watch. To install just click the icon. The watchface will be installed via Garmin Express on a connected desktop computer or via the Garmin Connect App on the paired phone. 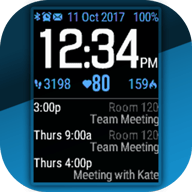 The watchface is only available for CIQ 2.3+ devices, currently for the Vivoactive HR. The version for Fenix 5/5S/5X/chronos, Vivoactive 3, Forerunner 735xt/935 and Approach S60 is ready for approving. If the upload was successfully and the Calendar Active Watch has it's initial 5min Update Rate, then the Calendar should be shown after 5 Minutes. You can change this Update Rate via the Watchface Settings. The qooApps Connect Companion will schedule a hourly update of your calendar, so you don't need to use the App everytime you've changed the calendar. If you have problems selecting or showing the correct calendar data in the Connect Companion App, please install the Calendar Test Android App and report the results to support [at] qooapps.com. 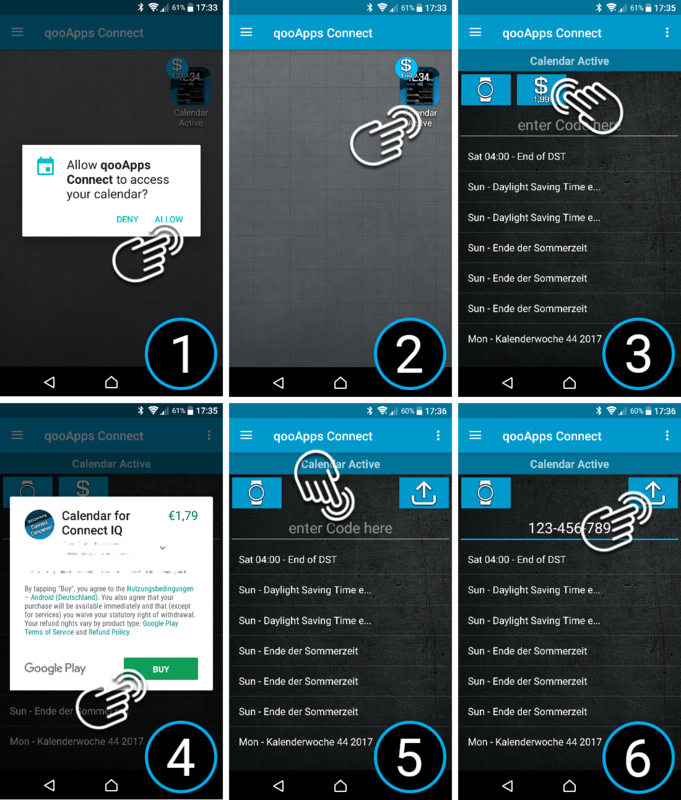 If you have problems selecting the correct calendar, please install the following beta version of qooApps Connect Companion. Garmin® and Connect IQ™ are trademarks of Garmin Ltd. or its subsidiaries, registered in the USA and other countries.